written for the final assignment in her American Musical Theatre course. Carousel was the second musical written by the popular team of the Golden Age, Rodgers and Hammerstein. The plot of the play is based on the 1909 play Liliom by Ferenc Molnar. Both Rodgers and Hammerstein agreed that Carousel was their favorite project that they had ever worked on together. The musical was constantly modified during out-of-town tryouts, but when it opened on Broadway on April 19, 1945, it was an instant hit with both critics and audiences. Carousel initially ran for 890 performances and duplicated its success in the West End in 1950. In 1956, it was turned into a film starring Gordon MacRae and Shirley Jones. Rodgers and Hammerstein are one of the most well-known music composing teams of this century. Rodgers wrote all of the music for the songs, while Hammerstein wrote the lyrics. They wrote many incredible hits that continue to receive great reviews. Examples of these shows are The King and I, The Sound of Music, South Pacific, and Oklahoma!, just to name a few. With all of their shows, the team won thirty-four Tony Awards, fifteen Academy Awards, the Pulitzer Prize, and two Grammy Awards. Before their partnership, Rodgers and Hammerstein achieved success independently. Rodgers had collaborated for more than two decades with Lorenz Hart. Among their many Broadway hits were the shows A Connecticut Yankee (1927), Babes in Arms (1937), The Boys from Syracuse (1938), Pal Joey (1940), and By Jupiter (1942), as well as many successful film projects. Hammerstein, a co-writer of the popular Rudolf Friml 1924 operetta Rose-Marie, and Sigmund Romberg operettas The Desert Song (1926) and The New Moon (1928), began a successful collaboration with composer Jerome Kern on Sunny (1925), which was a hit. Their 1927 musical Show Boat is considered to be one of the masterpieces of the American musical theatre. Other Hammerstein/Kern collaborations include Sweet Adeline (1929) and Very Warm for May (1939). By the early 1940s, Hart had sunk deeper into alcoholism and emotional turmoil, and he became unreliable, prompting Rodgers to approach Hammerstein to ask if he would consider working with him, and that’s where it all began with these two. (“Rodgers & Hammerstein.” 2015). The story begins in Maine 1873 as two young female millworkers visit the town’s carousel after work. One of them, Julie Jordan, meets Billy Bigelow, a handsome carousel worker who doesn’t have the best of reputations. But she falls in love with him anyways, and they get married. After they get married, Billy starts to become frustrated that he cannot find a job. He starts to become abusive in the relationship, but Julie still stays with him. Carrie Pipperidge, Julie’s best friend, is in love with a boy named Enoch Snow, who she is going to marry. Then, Billy meets his friend Jigger, and he talks about the good life of living on a boat, which makes Billy question leaving Julie. When he returns to her, she tells him that she is pregnant. Once Billy realizes this, Jigger suggests he rob the man who owns the mile, in order to make money for his baby. He tries to rob him, but gets caught and will be set to jail, so instead he kills himself. This entire musical is a memory, because Billy is really talking to the angels. After fifteen years, the angel’s allow Billy to go back and see his daughter graduate high school, and also see Julie, who is also sensing that Billy is right there with her, even though she cannot see him. All throughout the show, there are scenes featuring Billy and the Starkeeper, or the man Billy is sent to when he dies. In these scenes, the Starkeeper takes Billy through these memories, and he reflect on them (Carousel, 1945). Although this is a brief summary of the plot, there is much more to the story. The plot of this story is incredibly interesting, because it could be argued about who the true antagonist is- Billy or Julie. Regardless of this, the facts remain the same- the audience roots for these two lover to stay together. The audience is able to sympathize with them both. But, throughout this plot, there is evidence that the couple’s abusive relationship is romanticized, further enforcing the view of oppression of women in society. My final reflection for IS 2222 Introduction to Interdisciplinary Studies at Plymouth State University. At the beginning of my Introduction to Interdisciplinary Studies course, I thought I knew what I was getting myself into. I knew that the course was where I would create my own major, by combining two or more different disciplines to create my own studies. To be honest, I felt this class would be a breeze, considering I had already build my major almost a year previously. I was ambitious and excited to make my path final- and start learning what would be in my major. But the truth was, I did not have any idea what I was getting myself into, because I did not know the true meaning of Interdisciplinary Studies. Luckily, I do now. If on day one of taking this course I had been asked to define interdisciplinary studies, I would have probably said “it’s taking two or more majors and combining them into one.” Although I was on the right track, interdisciplinary studies is so much more than combining majors into a new one. Interdisciplinary studies is about taking control of your own learning. Interdisciplinary studies is about not only learning, but about how to learn. Interdisciplinary studies is about taking a situation and looking at it from all kinds of different perspectives in order to get the most useful ideas. Interdisciplinary Studies is so many things, but most importantly, Interdisciplinary Studies is absolutely essential. Throughout the course, we have used Allen F. Repko’s book Introduction to Interdisciplinary Studies, to get a good understanding of the field. Based on all my studies, my definition of interdisciplinary studies is studying multiple disciplines and their connections, in order to address topics from multiple different perspectives. For example, by using an interdisciplinary approach of studying education and health, you can use your knowledge of health to benefit your educational goals, as well as use your knowledge and experience of education, in tackling matter of health. Interdisciplinarity offers the ability to speak outside of one perspective of knowledge, and into another in order to create a more well-round way of thinking, problem-solving, and growing. The title of my Interdisciplinary Studies degree in The Performing Arts for Community Empowerment. This degree allows me to study the positive effects that music, theatre, and dance have in terms of community outreach, education, and empowerment- on both micro and macro-levels. At the micro-level, the performing arts can help individuals in many different ways including providing an outlet for self-expression, help build personal self-esteem, and even provide a style of learning that could best suit a particular child. On a macro-level, the performing arts can also have a positive benefit on a community. Music, theatre, and dance all have many beneficial qualities that affect communities such as bringing people together, helping people remember things, and getting across feelings or emotions. Because of these attributes, the performing arts can have a positive impact on community outreach efforts, education, etc. In many communities as well, the performing arts can be a tool to advocate for Social Justice. My program is interdisciplinary because it uses lots of different perspectives and outlooks in order to get the best understanding of how to help me achieve my goal- helping others through the performing arts. By combining multiple courses from multiple disciplines, I will have an overall better understanding of the different impacts that music, theatre, and dance can have on social situations. One specific theory that we have talked about that directly corresponds with my major is the Complexity Theory. The Complexity Theory is the combination of two or more disciplines that have unique connections, oftentimes unexpectedly. The disciplines that I have combined are the performing arts (music, theatre, and dance) and the social disciplines (social work, social justice, education, etc.) Now looking at those disciplines, you might not see any connections whatsoever. However, the more you study them, the more connections you see between them. For example, music (whether it be through singing, playing an instrument, or even just listening to it) naturally has qualities that improve memory, assist in empowerment, and reduce stress. By using in interdisciplinary approach, you are able to identify those benefits, and use them towards providing social success. A few examples would be using a song in an education setting to improve academic success or performing a song to help a client break through an emotion barrier. The possibilities are truly endless. My number one goal for the future is simple. I want to be constantly helping other people, and making a difference through the performing arts. I would love to work with youth members on an empowerment-based program through the Musical Theatre. I would love to use performance to advocate for Social Justice. I would love to become a teacher and help students identify with their material through song and dance. I would love to do so many things, and luckily with my Interdisciplinary Studies knowledge, my future is not unreachable. My hope for the future of Interdisciplinary Studies is that the future IS Interdisciplinary Studies. By studying this field, I have learned more about knowledge as a whole then I ever thought possible. By studying just one discipline, it is truly impossible to see all of the opportunities that that discipline can have. An interdisciplinarian knows that there is never an end point to knowledge. There is always another perspective to view something from. There is always a nothing side of the story to explore. There is always room for more knowledge and growth. Knowing this, I urge all high schools, universities, and even every single student to take responsibility for their own education, and learn about interdisciplinary studies. My hope for the future is that Interdisciplinary Studies will no longer be seen as a new and interesting field, but a key concept in learning and obtaining knowledge- in the formal school setting as well as every day in real life. Well, Interdisciplinary Studies, thank you for introducing yourself to me, and I promise to never be a stranger. A huge thank you to Robin DeRosa, the professor of IS 2222 Introduction to Interdisciplinary Studies. You have truly inspired me. Thank you for showing me the light that is Interdisciplinary Studies. “Teaching Social Studies Through the Performing Arts,” is an article written by Binta M. Colley, which explores a unique graduate program opportunity involving combining the theater with the education of Social Studies. Because of its nature, the concept of Social Studies is an ever-changing subject. The emphasis throughout the years has shifted from personal development and civic education, to discipline or subject-based, to inquiry-based, to textbook-driven and more. This constant changing and misrepresentation of Social Studies often causes the content in the primary grades to become trite, redundant, and unlikely to truly help student accomplish goals in regards to Social Studies. However, according to Brophy et al, “we believe that the problem lies not with the topics addressed within the expanding framework, but with the way that these topics have been taught” (Brophy). In order to take this thought one step further, a pilot project was created for aspiring teachers in different graduate programs. This program was geared on giving teachers a better understanding of how the performing arts can be used to help in Social Studies education. This project consisted of three components: studying the script of the play, attending an actual performance of the play in a professional theatre production, and participating in four workshops. The first workshop happened right before seeing the professional production at the Manhattan Theatre Club. During this first workshop, the participants were given an introduction to script elements and the use of monologues to convey emotion, place, and events. What elements make a dramatic scene? What did each character want? What action did the characters take to get what they wanted? What went on before and what will happen next? After reflecting and answering the questions, they were prompted to discover that these questions were always those that could be asked of any historical event. Then, each of the participants were asked to write a monologue based on an actual newspaper article- the story of a murder in Milwaukee where a man was beaten to death by a group of adolescents and teenagers.They discussed different character perspectives and overall themes they wanted portrayed in their monologues as these characters (Colley). During the third workshop, they continued to work on these monologues. Each participant did a reading of his/her own work, and then they worked as a team to create a skit based on what each of them had written, which featured, “…a brief montage to introduce the audience to the storyline, and then a one-act play to present the entire story. They discussed the point of view (POV) of each character, and determined the order in which each character would be presented” (Colley, 6). The education director from the theater group attended and also gave suggestions. The skit was rehearsed in the same manner that it would have been done for a stage production, and a final script was created. For the fourth and final workshop of the project, the participants took a final look at the script, and then did an actual performance of it, which was recorded so they could all watch it themselves. Each of the student had explored the topic from many perspectives, and had received what Efland (2002) referred to as “a hypertext exposure. In other words, they understood drama as a complex process involving many interrelated pieces that fit together in a particular way.” This whole workshop was taped, first with the input from the teaching artist (the leader of the project), then on their own, in a final performance ran just as it would in a normal theatre setting. After the project was over, the participant had time to reflect upon their experiences. At the beginning of the project, many teachers were hesitant about the true effect of integrating Theatre into Social Studies. One participant had originally stated, “ At first I was a bit taken back because when you think of drama, you think of having skills to act. And education is one thing, but drama is another.” By the end of the project, the same person regarded, “When she [the facilitator] took us through the steps about how to use a newspaper article to analyze characters and write a plot, it made more sense. I was really moved by the end product.” All of the future teachers involved shared that enlightenment of the positive effect that the performing arts can make on teaching Social Studies. 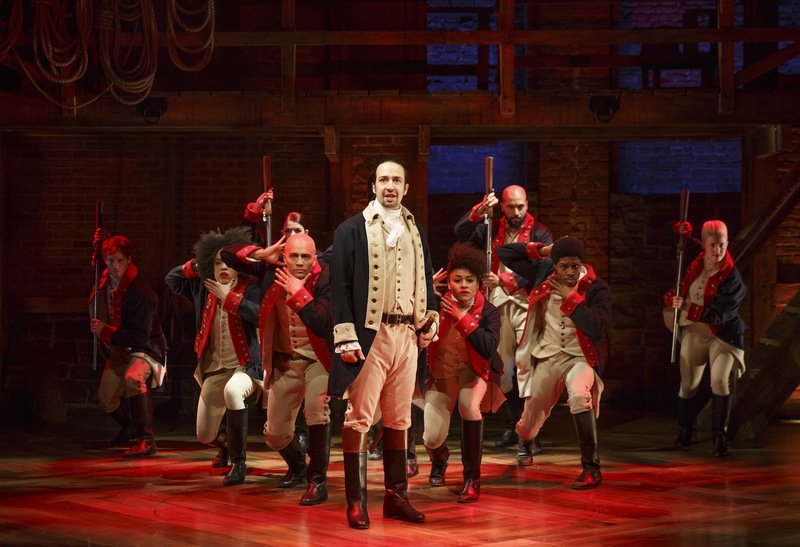 Photo from the new Broadway musical “Hamilton,” based on the biography of Alexander Hamilton. Reflecting this back into my own interdisciplinarity, it is refreshing to see that work is being done in the field that I wish to pursue. The unique qualities of the performing arts can often aid in assisting many social situation, including education. In my career as a future professional, I truly hope to be doing similar studies, and educating more people about the benefits of integrating the arts into education. In addition, reading this article made it very easy for me to make connections from my performing background to education. Although the participants of the projects could see great effects after the project was over, I was able to think about their journey in regards to performance and education, and really ponder why the use of theatre, monologuing, and dramatization has such an impact on education. For example, by putting myself in the perspectives of the teachers performing their monologues, I could see how identifying with one character, and truly taking on the emotional, mental, and physical perspective of that character, could give the learner an overall understanding of not only the events that happened, but why they happened, what affected them, how the experience made them feel, etc. Combining the performing arts with the education of Social Studies provides a valuable opportunity for learning. Brophy, J., Alleman, J. and O’Mahony, C. 2000. “Elementary school social studies: Yesterday, today, and tomorrow”. In In American education: Yesterday, today, and tomorrow. Ninety-ninth yearbook of the National Society for the Study of Education, Part II, Edited by: Good, T. 256–312. Chicago: University of Chicago Press.